For casual dining with friends, The Family Dog offers small plates and more substantial fare in Morningside. : Founded by Ron Eyester, The Family Dog was purchased by new owners and reopened in January 2016. 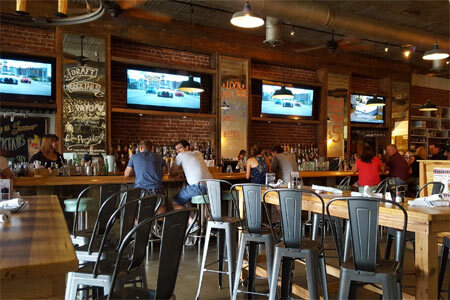 The interior boasts a black-and-white mural of the Grateful Dead in performance, while on the opposite wall, flat-screen TVs provide constant contact with the outside world. A chalkboard touts healthy fare. Community tables allow large parties to mingle in celebration. Foods are simple, with a variety of salads and sandwiches. We like to make a meal out of the small Caesar and the panko-crusted fried shrimp, an appetizer but just enough for a light lunch. Someone in the kitchen knows how to fry properly. Shrimp are crisp and light. Burgers and other sandwiches provide more substantial fare, as do specials. Breakfast is served all day. Desserts are available. Brews, including many local craft suds, are poured in 16-ounce sizes, and there are a few wines. Service is upbeat and friendly.